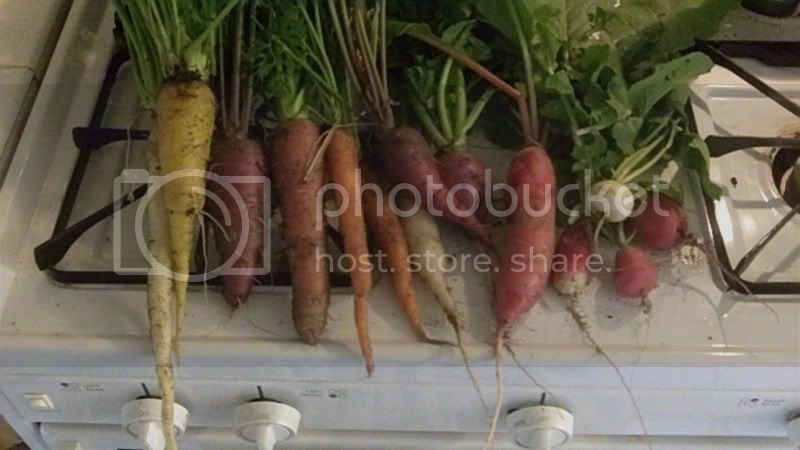 I pulled up some carrots and radishes today. I left lots in the ground to get a little bigger, some I am letting go to seed as well. I also replanted more seeds to get one more harvest of carrots before Spring. I may pickle all this produce here but not sure yet. I have been pulling radishes all fall. Probably the easiest thing I have grown. They mature so fast too. Probably in about another 10 days I will pull more carrots and leave a few to go to seed. In a few days I will pull more radishes too just want them to get a little bigger. 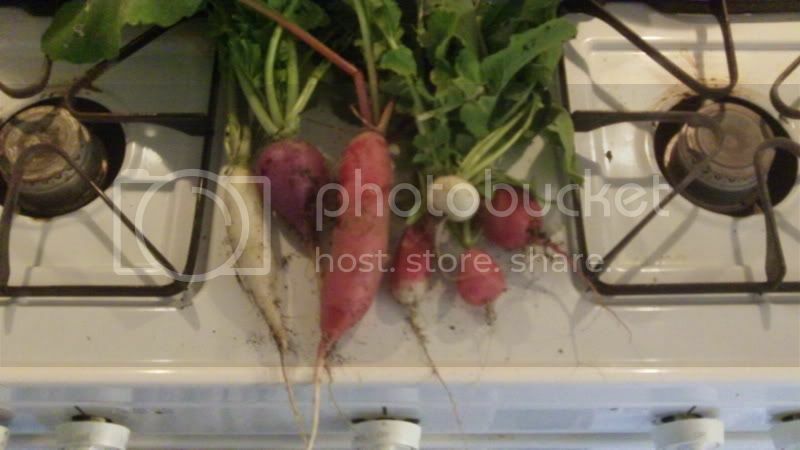 I also got beets growing, I have the detroit red, but I planted some golden beets as well. More radish, carrot, and beet seeds went in the ground after I harvested these. I tilled in some compost then put the seeds down. Looks great! Enjoy your dinner. I just got some Purple carrot seeds, but don't have any space left to plant them, but do they harvest as fast as radish you think? because after my radish grow out i want to throw in some carrots, I now see my Radish Sprouted today. Very nice harvest! But you do know that your carrots won't produce any seed this year, right? They are biennial, meaning they only send up a flower stalk and produce seed the second year. By that time the carrot will be pretty woody and inedible. I've never tried growing carrots for seed, because it seems like kind of a waste of garden space. But you wouldn't need to leave very many. I think if one goes to seed it produces a lot of seeds. 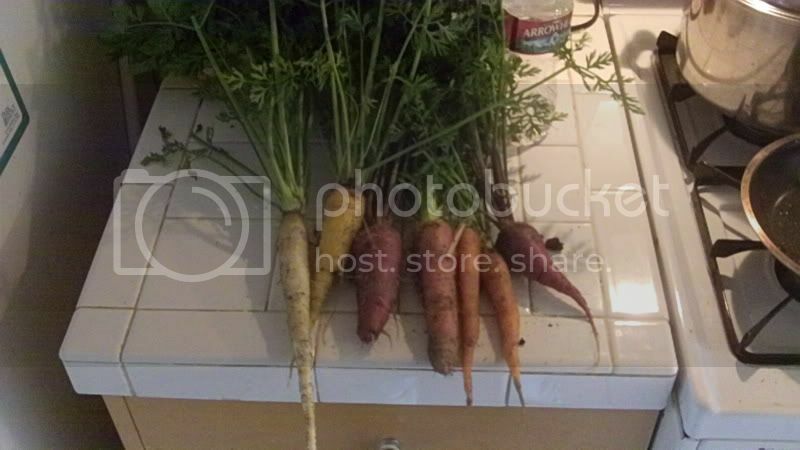 OROZCONLECHE wrote: I just got some Purple carrot seeds, but don't have any space left to plant them, but do they harvest as fast as radish you think? because after my radish grow out i want to throw in some carrots, I now see my Radish Sprouted today. Carrots take a while to grow. I put some of these in the ground September 1st and just now pulling some out. They take around 75-80 days. The radishes are pretty quick, after you pull some radishes out you can put carrots. I put more carrot seeds now because I want them to be ready before April. So I plan to have most if all my fall stuff finished up by mid March. Then I will let the beds rest and add compost and some organic fertilizer etc. rainbowgardener wrote: Very nice harvest! But you do know that your carrots won't produce any seed this year, right? They are biennial, meaning they only send up a flower stalk and produce seed the second year. By that time the carrot will be pretty woody and inedible. I've never tried growing carrots for seed, because it seems like kind of a waste of garden space. But you wouldn't need to leave very many. I think if one goes to seed it produces a lot of seeds. Yep I know they are biennials. I am going to leave only 2 of them to go to seed. I hear their flowers attract good bugs. Plus having lots of carrot seeds is nice. I also have a Parsley plant I am gonna let go to seed. I know that one is a biennial too. I have a Radish plant that is huge but still no flowers. Do any of you guys eat the carrot tops too? I use it/eat it just like parsley. I made a nice salad tonight with the tops. I coarsely chopped the carrots tops up, added some black olives, corn, and some chopped tomatoes. Then olive oil, apple cider vinegar, and sea salt. I like using the carrot tops too -- salad, soup garnish, even hidden in muffins. Since the fresh tops spoil quickly, what I can't use up fresh, I dry and use like dried parsley or chop and freeze. Nice! I put mine in Oct 16th so I'd better wait until the end of Jan, lol.